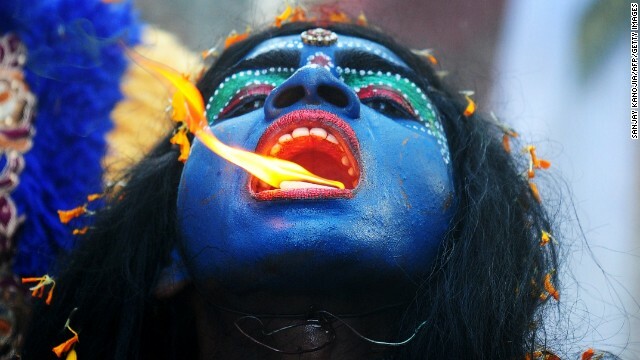 An Indian artist dresses as Kali, the goddess of destruction, at a festival in Allahabad earlier this month. (CNN) - Caste. Cows. Karma. Suhag Shukla knows that’s how some people outside Hinduism see her religion. As the head of the Hindu American Foundation, Shukla, 42, clarifies misconceptions all the time. Hinduism is ancient, though there is no specific date for when it was formed. The name is a Sanskrit word; Hinduism and Hindu were coined by invaders who used the terms to refer to the people they encountered when they crossed the Hindu Kush mountains and arrived at the Indus River. In America, Hinduism’s profile was elevated by Indian immigrants who brought their customs and rituals with them and perhaps most recently, by the growing popularity of Hindu teachings like yoga and meditation. Hinduism is the world’s oldest living religion and the third largest – behind Christianity and Islam – with more than 1 billion followers. Some argue that Hinduism is more a way of life than religion. It has no common creed or church. Nor is it based on the teachings of a founder or holy book. And it remains a mystery for many. Myth No. 1: There are 330 million Hindu gods. Reality: There is one supreme God that cannot be fully known or understood. Hindus are encouraged to relate to God in the way that suits them best, like worshipping many deities who are believed to be manifestations of God. The trimurti or three main deities are Brahma, the creator; Vishnu, the preserver; and Shiva, the destroyer. That’s why Hinduism is often thought of as polytheistic. It is not. But there’s debate on the proper terminology for Hinduism. Some call it a monistic religion, derived from the belief that everything in the universe is part of one substance or nature. Some, including Shukla, say Hindusim is henotheistic, which is the worship of one god without denying the existence of other gods. Others, say it is monotheistic. Myth No. 2: Hindus are idol worshippers. Reality: Hindus worship a reminder of God. No Hindu will say he or she is worshipping an idol. Instead, Hindus believe a physical representation of God – in the form of an idol - helps them focus on an aspect of prayer or meditation. For instance, a person who has just opened up a new business may worship Ganesh, the elephant god who represents success. Myth No. 3: Hindus worship cows. Reality: Hindus do not pray to cows but they do regard all creation and all life as sacred. Hindus believe every living thing has a soul. It is true, however, that cows hold a special place in Hindu society. That’s why Hindus refrain from eating beef. Cows are seen as gentle, maternal figures that are providers of milk and other forms of sustenance. They are honored for their value. Myth No. 4: All Hindus are vegetarians. Reality: A majority of Hindus eat meat. But about 30 percent do not. That stems from a fundamental belief in ahimsa, the principle of non-violence. Since all living things are manifestations of God, violence against them is considered contrary to the natural balance of the universe. Myth No. 5: Hinduism supports a discriminatory caste system. Reality: Caste discrimination is rooted not in religion but culture. Caste was an ancient system of occupational class delineated in Hindu texts that over the years developed into a rigid social hierarchy. The lowest castes, or untouchables, were marginalized and faced persecution. But many modern Hindus have argued that caste-based discrimination is not intrinsic to Hinduism and should not be thought of as religiously sanctioned. Myth No. 6: Women are subservient in Hinduism. Reality: Not because of religion. Actually, one attribute that differentiates Hinduism from say, Christianity or Islam, is that it recognizes forms of god as feminine. Hindus revere Shakti, or the personification of God's energy through a female figure. Some of the most commonly worshipped goddesses are Parvati, a primary form of Shakti; Saraswati, the goddess of wisdom; and Lakshmi, goddess of prosperity. Women in India may not be equal with men but again, that is not because of religion but culture and people using religion to keep women down. This is akin, perhaps, to Islamic societies forcing women to cover up from head to toe. Myth No. 7: Hindu women wearing ‘red dots’ on their foreheads are married. A red dot was once a symbol of marriage for Hindu women. Today, the dot, or bindi, is largely decorative. Girls and women – married and single - wear bindis of all colors as fashion statements. A tilak, also a mark on the forehead, has religious significance. It's generally made with sandalwood paste, ashes or red turmeric and can be in the form of lines or a dot. Myth No. 8: The Bhagavad Gita is like the Bible. Reality: There is not one central, authoritative book in Hinduism. But Hinduism is rich in scripture with a vast collection of ancient religious writings. Hindus believe god revealed truths to wise men who passed them on for thousands of years through a rich oral tradition. The scriptures include the Vedas, the Upanishads, the Puranas and the Bhagavad Gita, or Song of God. Part of the epic tale, Mahabharata, the 700-verse Gita is the world’s longest poem and takes the form of a dialog on a battlefield between a prince, Arjuna, and Krishna. It captures the core beliefs of Hinduism but not all Hindus read the Gita. Myth No. 9: Karma is fatalistic. Reality: Everyone has the ability to choose life’s actions. This is the theory behind karma: for every action a person sets in motion, there is a corresponding reaction. Hindus believe they have to face the consequences of past actions. Each person creates his or her destiny with deeds. The ultimate goal is to have karma that will free a soul and gain moksha, or liberation from the cycle of rebirth. "fundamental belief in ahimsa" . Vedic Hindu rituals had animal sacrifice and Buddha objected to it so I wonder if the writer is considering Buddhism as part of Hinduism or I have incorrect information. Please quote a verse in Sanskrit that shows Hinduism believed in Ahimsa the way Gandhi brought it to the world. You could be the one who is lost. There is no indication that there are any "gods". ALL religions are made by men. Right, like many, Pradeep makes an grave error. "God" is a noun and refers to a male, creator being. To be intellectually honest, one needs to find another word if they are going to make up another definition. And, true, all religions are made by people (but, of course, lots of other things are as well and does not necessarily make religion, etc., bad). So, most Christians consider Buddhism a cult. Hi opinion is as worthless as any other from the outside looking in. This article is just like all those written by christian or muslim apologists...Bu– Sh–! I just would like to point out that culture and religion should not be mixed up! All the good came from the religion, all the bad you know like caste system, and women being subservient came from people and society using religion to mess things up! Isn't the caste system tied to the belief in reincarnation? Isn't the belief that mortals go through cycles of rebirth and get elevated up the caste hierarchy? How can you not believe in the caste system but believe in reincarnation? No that's a common misconception. Reincarnation itself, without the distortion that society has put on it with the caste system, is that ALL living beings have souls that transcend lives. You can be reborn as a certain animal based on your fulfillment to your dharma in your current life. Humans are the "highest" achievement in reincarnation, but that's all it's about. People are the ones who screwed it up and added that in human life itself, their are higher levels i.e. the caste system. It was a corrupt and power hungry way that the "top" could stay at the top and gain reverence. But in Hinduism itself, reincarnation doesn't speak about their being varying levels of human life. All living beings are important, and your deeds and duty in your current life will determine where your soul ends up in the next one. There are a few errors in the article. First is in saying the words Hindu or Hinduism are Sanskrit, and then saying they were coined by invaders? That makes no sense. The word Hindu is the old Persian version of the Sanskrit word Sindhu, which means river. The ancient Hindu or Vedic civilization they encountered in ancient India and Pakistan was centered around two rivers, the Indus and Saraswati (no longer a river). The Persians called the land Hindustan, land of the rivers, and the people Hindus. The word Hinduism is obviously of English origin, coined by the British, the "ism" being the giveaway. Old Persian culture was similar to the ancient Vedic culture in many ways, for example both calling themselves 'arya,' or 'aryan' ( the plural of arya.) in fact Iran is the Persian word for aryan. 'Arya' means kind, true, respectable, noble etc., in Sanskrit. 1. While many or most Hindus believe in one supreme being (Vishnu, Shiva, or Devi depending on the sect) or one supreme impersonal qua conscious reality (Brahman), there are many Hindus who believe there are many lesser divinities, demigods, akin to angels or archangels, who are referred to as devas or gods – like Indra, Surya, Varuna, etc. Some believe they are all manifestations of the one supreme being; others believe they are anthropomorphic; others believe they are real beings who aid in the management of the universe. They are also the original source of angelology in Abrahamic religions, which was infused into Judaism from the Zoroastrian Persians when they freed them from captivity in Babylon and aided in the creation of Judaism in Israel. The Zoroastrian concept of demigods or angels was most likely imported from India, since they share many names, e.g. Mitra, and the Vedic religion predates it. 2. While many Hindus believe the idols (murti) are representations for meditation, for many others they are also directly the God or Goddess themself, who personally manifest in the idol through a ritual in order to recieve worship, e.g. offering of food, flowers, jewelery, etc. The idol becomes the God though the ritual and the worship, there are many stories of all sorts of miracles involving idols in most all sects of Hindusim. 3. Many Hindus do worship cows, it's called go-puja or gopuja. They don't worship them as God, but they worship them nonetheless, just like they may worship a sacred place or person. 4, 5, 6, 7. All correct. 8. The Bhagavad Gita is not the longest poem in the world, in the fact the entire "Mahabharata" is written in verse and is considered by many to be the longest poem, while others will say the Tibetan "Epic of King Gesar" is even longer. You were thinking that you will not fight, but that is due to your misconception of your self and reality, that resolution was in vain, primordial nature will engage you (make you fight). Your desire is illusory. Bound by actions born of your nature, son of Kunti, helpless, you will act. The supreme ruler is at the heart of all beings Arjuna, motivating the movements of all living beings, who are mounted on the machine of his universal deluding power. Oops, make that to prevent pregnancy and STDs. The divine is thought ultimately to be one essence. And yet Hindus subscribe to polytheism, believing in many gods and godesses (traditionally 330 million!). We can best understand this apparent contradiction by continuing to think of the ocean. Though we speak of different oceans that fill separate areas of the earth's surface, there is in reality only one body of water. One person could be surfing in the Pacific while thousands of miles away her cousin is sailing on the Atlantic, each apparently enjoying a different ocean. But if you look at a map or a globe, you will see that the oceans of the world are not divided by any continuous landmasses; ultimately they form one body of water. Hinduism generally regards its 330 million deities as extensions of one ultimate reality, many names for one ocean, many "masks" for one God. Because the divine reality of Brahman or Atman is beyond the reach of the senses and of thought, humans need accessible points of contact with the divine. Ultimate reality needs to be revealed if it is to affect the individual. Hinduism's many deities provide these points of contact, each with its own personal characteristics. Hindus can freely worship whichever gods and goddesses they like. Given the vast number of deities, at lease one will surely provide an effective point of contact with the divine. Again, the terms "God" and "gods" do not really apply to the Hindu/Yogic Dharma. Think about the use of small "g." What's up with that? We even capitalize our own names. Also you make a basic contradiction "reality of Brahman and Atman" and then you can't know it? The Christians believe in three gods and claim it is one. I have worked with a very large number of computer programmers from India since our government has seen fit to tax corporations such that it is cheaper to hire 3 developers from India than one from America, but I digress. Over the past 15 years I have learned a great deal about their religion, customs and culture. They are a fascinating people and if I can make a broad generalization, they are some of the most gentle, kind people I have met. Many are vegan, but many also eat meat. There is a massive array of different sects or branches of Hinduism. Many of the men I work with I see go through the marriage process when they reach a certain age (25-30). For many their parents send them a portfolio of potential candidates the match them in terms of monitory level, religious branch "closeness" and family background. From that they choose one and travel back to India where they spend weeks after the ceremony spending a night together at each relative's home. In many cases the Parents raise any children they have, or move to America to assist in raising them. Divorce is taboo, each has their role and play it without question. In many ways it is similar to the way America was in its first 170 years (until the 60's). Indians are awesome for the most part. Misers, sneaky, opportunists, adulation, back stabbing, hygiene are some words that come to mind. LOL!!!! I just realized something. Atheists are in the closet about having faith. Awww. If they admit they have faith, they can no longer do what they always have done! Awwwww!!!!! Poor babies! Go cry to mommy now! Wow. You realize you are embarrassing yourself, right? You believe in fairy tales, and then need to pretend that others do to, just so you don't feel so alone in your delusions. Does it work? Learn to read. Said nothing about any gods. Does your childish delusion make you stupid? If you're not an atheist, and it's is obvious that you're not, the logical (something you seem big on) assumption is that you are a believer of some sort. It's implied, whether you outright stated it or not. What does your screed against atheism have to do with the article? Did you read it? It was about a religion other than Christianity, not the lack of religion. How does a lack of belief due to inefficient evidence involve "faith"? Sorry, that should be "insufficient". A couple of important clarifications: The Monotheistic terms "God" and "god" do not apply to Hindu Dharma. The use of small "g" is insulting. Who is the big "G?" Note the confusion "god as feminine." God is, basically, a Christian term and refers to a "Male, Creator Being." The writer misses an opportunity to explain the bindi rather than except its trivial use. The holy mark at the third-eye point is actually part of the beautiful Sanskrit/Hindu word (H)indu. Also, caste is really not part of Hindu Dharma. The proper term is Varna which means the tone or the natural way of being/interests. Caste is a Portuguese term and means "breed." But, like many other areas of confusion within the Hindu/Yogic Dharma, many Hindus misuse the terms of others and also allow their sacred terms to be misused. The Sanskrit/Hindu term "Yoga" is prime example of a term almost completely devoid of its real meaning within the Hindu religion. I use small letters for every make believe beings. Your "gods" or any others. For one "to know" all the "gods" are make believe, one would have to be all-knowing. Just more new-agey silliness. There you go. See how silly these people are but not much fun. About time everyone got it right. I am currently reading the Mahabharata. I have seen just one English language play-movie of this great epic, but it has given me a taste of the rich spiritual story this work contains. It continues to amaze me how little effort apparently has been done to make this world classic available in English. Abortion and war are the karma for killing animals. I wonder if animal activist and conservative Republican Bob Barker is forced to masquerade as "Jewish" or "Muslim" around meat-eating pro-lifers, or if he can freely and openly discuss animal issues with them, and convince them to go vegan, join PETA, etc. as the *solution* to the abortion crisis. Rather than admit that it's wrong to kill animals, that animals have the right to life, etc. meat-eating pro-lifers appear to be eating meat with a guilty conscience, and trying to rationalize it by dismissing vegetarianism as someone else's "religious belief" which they think doesn't apply to them. A lot of people look at abortion that way, too, you know! Is not "killing" a living tomato etc. also destroying life?? Why are there ~ one million abortions every year in the USA? All the numbers are posted on line by Guttmacher if you want to run the calculations. So again we see the BRUTAL EFFECTS OF STUPIDITY!!!! If you are going to list the "actual" rates of contraceptives, which I assume you mean as opposed to "perfect use", then you must also list the numbers for actual instances of those who (try to) practice abstinence. It's the intellectually honest thing to do. You can't compare artificial contraceptives "as actually used" to "perfect use" of abstinence. Yes, used perfectly, abstinence works. How could it not? But in the real world where no method, including abstinence, is implemented perfectly, the failure rate for abstinence is much, much higher than the failure rate for the pill and condoms. Abstinence by definition is 100% effective as a means to prevent contraception. As is masturbation. You might want to contact the Guttmacher Insti-tute about their classification of the actual failure rates of the Pill and condom. It would appear instead to be a subset of failure rates of unprotected se-xual activities. I would list it under THE BRUTAL EFFECTS OF STUPIDITY. "A lot of people look at abortion that way, too"
Who are you to make that call? Are you capable of having an abortion? Have you read anything about it or have you just listened to the obnoxious uneducated fools who think it's baby-killing? Before spewing about something make sure you grasp the basic concept that what a person does with their body is not your business nor the business of any god.